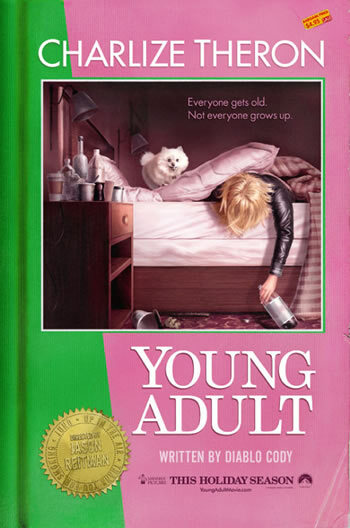 The first poster for Jason Reitman‘s latest film, Young Adult, starring Charlize Theron and penned by Diablo Cody (Juno) has debuted. Paramount has been keeping this one close to the chest for the longest time, but as the awards season begins to gain momentum it looks like they’re finally prepared to rip the lid off this thing. The film centers on Mavis Gary (Theron), a writer of teen literature who returns to her small hometown to relive her glory days and attempt to reclaim her happily married high school sweetheart (Patrick Wilson). When returning home proves more difficult than she thought, Mavis forms an unusual bond with a former classmate (Patton Oswalt) who hasn’t quite gotten over high school, either. After so much success recently, Reitman’s film is obviously considered to be an Oscar Contender and Theron will certainly be looked out for Best Actress consideration. The question is, what kind of film should we be looking forward to? Unlike Up in the Air, Paramount is keeping the film off the festival circuit, most likely because they saw the way Up in the Air earned plenty of kudos beginning in Telluride only to go home empty handed at the Oscars despite six nominations. Sure, people will always say it’s just an honor to be nominated, but with six noms you better believe Paramount was hoping to at least walk away with one. So for now, we wait, as the film will debut on limited screens on December 9 and expand on December 16. If you missed the previously released first look at Theron in character click here and for a hi-res look at the poster above click here.